Bookmarks is rated 4.9 out of 5 by 19. Craft your bookmarks in your own style with our custom sizes, paper types, and finishes. "The bookmarks serve double-duty - giving out contact information while teaching people about dogs…The bookmarks look great: sturdy, glossy, and high quality. The trimming is consistent throughout the order. I love that it's easy to reorder because files are saved in my account. Overall, I have been very happy with the bookmarks and other products that I've ordered from PrintPlace.com." Rated 5 out of 5 by Cooliex from Right on the Mark I ordered some bookmarks a few weeks ago and the quality was superb. Would highly recommend. Rated 5 out of 5 by CFNI from Great bookmarks! We ordered these bookmarks for a special event we were having and they came out beautiful. Great quality, nice thick paper, great matte finish. Perfect! Rated 5 out of 5 by LisaK from Even better than expected! I'm glad I used Print Place for these bookmarks. The specifications for the artwork are clear, ordering and uploading art easy, and they turned out lovely! Rated 5 out of 5 by Yelena from Excellent job!!! Thank you for bookmarks!!! Everyone loved it! It came faster than expected. Will order for sure again! Personalized bookmarks are inexpensive marketing tools that are actually useful. They are ideal marketing pieces because customers keep and use them over and over. They continue promoting your message the whole time. Just upload your artwork then choose your printing options. With our price match, on-time, and satisfaction guarantees, PrintPlace is your ideal place for bookmark printing. In a hurry? Same day turnaround is available when you print bookmarks on PrintPlace.com. More custom options are available by calling us at 877-405-3949, M-F (7am-8pm CT) or by filling out our custom order form. Download the layout template below for your bookmark dimensions. It will help you verify that your artwork meets all of our guidelines. This means checking if your text fits inside the caution zone and your design bleeds to the paper’s edge. Follow the specifications provided so you can be sure your artwork prints correctly. You can download PDF, EPS, JPG, and Publisher versions of each layout template. Printing bookmarks through PrintPlace is a creative way to connect with your customers. Because they are unique promotional items, they will set your message apart. They can be used in all sorts of ways. You can use them as calendars, coupons, or discounts for customers. It can be included in your marketing campaign. They can be used as company gifts. Since customers have a practical use for them, they will keep your message in a nearby book and see it on a regular basis. Use bookmarks to promote your brand and include your contact information. 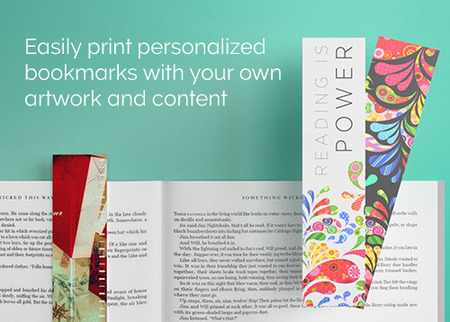 Custom bookmarks are easy to design and even easier to print when you work with PrintPlace. We offer 1/4" or 1/8" rounded corners as well. You can use our instant pricing tool to explore your options and give us a call if you have any questions.